Every Saturday night, Elvin and Frances Rodengen scoured newspaper ads for buggies, strollers, wagons — you name it. The couple would buy and fix up the items and resell them from their front yard. The business grew and, in 1945, they opened the Fridley Heights Cyclery on E. Hennepin Avenue near the old Grain Belt brewery in northeast Minneapolis, said their grandson Douglas Rodengen. The business moved to Columbia Heights in 1969, and around that time, Douglas began working there. It felt good to help out his parents, who were then running things. “It was a great time in life,” he said. Today, the shop is still there, still selling and repairing bikes — and still in the family. Douglas Rodengen is now the owner. Fridley Heights Cyclery is one of the oldest bicycle shops around and maybe the longest-running Schwinn dealer in the state, said Rodengen, as he leaned on a wooden display case that dates to the original store. The place has an old-time feel, with vintage Schwinn signs and clocks that light up, along with a couple of antique bikes on display, including a 1969 Schwinn Orange Krate. Douglas Rodengen put it together when it was brand new. Many people who come in remember buying their first bike at the shop years ago, and sometimes they bring it back in to be restored. Fridley Heights Cyclery has some parts for vintage models on hand. At this point, it’s a matter of how long that pile lasts, Rodengen said. At the same time, the shop has a wide selection of the “latest and greatest” bikes and accessories, he said. Just as the business is a family affair, it caters to families with a selection of middle-of-the-road-type bikes for all ages and tastes — “a little of everything,” Rodengen said. Some customers are hobbyists who fix up bikes in their spare time. But the clientele runs the gamut. One man came in recently with his pastor to pay for a bike he stole from the shop in the 1980s. “Everyone walks in with different wants and needs, different dreams,” Rodengen said. Since then, the shop’s demographics have changed somewhat. In general, the clientele has gotten older. Often, older customers are shopping for “comfort bikes,” which are designed so that they can ride with ease, said shop repairman Tony Novak. There have been other changes. Earlier bikes were more labor-intensive to build and in the past the store had a bigger staff, Rodengen said. Children used to save up to buy a bike. Now people have credit cards and “you don’t see that” anymore, he said. Plenty of young people come to the store, but there’s a feeling that the younger generation is more wrapped up in electronics and games, Rodengen said. Still, many families want their children to have bikes. Over the past few years, cost has been a factor, and more people pick up bikes at discount stores, he said. The recession had an impact. Yet, activity is on the upswing. Riding in groups as a social activity is a current trend, and more people are donning helmets, while bike lanes and bike-sharing programs are springing up. The bike shop sees the full spectrum. Hybrid bikes — a mix of road and off-road bikes — are popular, and the nostalgic cruiser-style bike has made a comeback as well, according to Chris Rodengen, Douglas’ son who occasionally helps out around the shop. However, in many respects, bike riding has always been popular in the area, even in the winter, he said. For Chris Rodengen, being exposed to the bike business from day one has made him passionate about riding. He especially enjoys mountain biking “and I try to keep up with my brothers on the road bike,” he said. Likewise, Chris’ customers have had a profound impact on him, he said. Some of his “regulars” inspired him to pursue the field of Geographic Information Systems (GIS), doing mapping and spatial analysis. Now, he’s a GIS manager. “I used to practice by doing projects with bicycle trail maps,” he said. Tony Novak also found his calling at the store. Novak, who’s in charge of the repair side of things, has been working at the store since 1979. He’s been in the industry even longer. Novak had a knack for it, so he stuck with it, he said. Years ago, biking was his main mode of transportation. “It just made sense to buzz around in the Cities without a car.” Now, with “bad knees,” he doesn’t ride as much for pleasure anymore. Still, Novak hangs onto a bunch of bikes he’s collected through time, including many antiques. “I just have bikes I enjoy looking at. And a few of them I enjoy riding,” he said. Novak sees the beauty in many types of bikes. “Certain old bikes are more of a pleasure to work on. The high-quality ones from years ago were built to last,” he said. Though basic bike design hasn’t changed too much, he said, today’s racer models are like spaceships compared with those of 30 years ago. Maybe it’s a backlash to fixing so many bikes that have multiple gears, but he goes for simplicity, Novak added. For him, “every day is different. You never know who will walk in the door,” which is part of the fun of being there, he said. The shop is a destination place. Some people return even after moving far away. 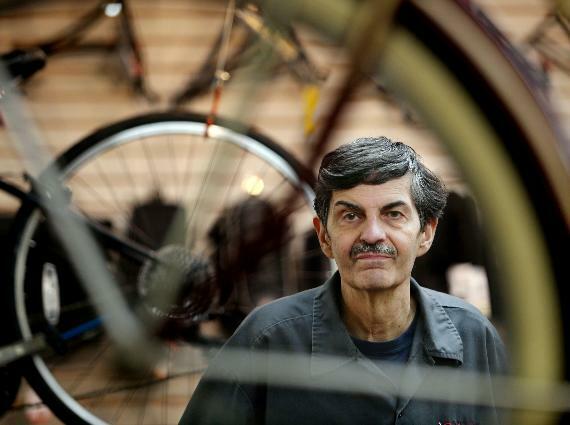 In fact, he knows customers who “go back longer than I’ve been here.” He often hears, “ ‘I bought my first bike here in 1982,’ and then they look at me and say, ‘You used to be here, too,’ ” Novak said. It’s those long-standing relationships with community members that help keep the shop going. For Douglas Rodengen, it’s fun seeing the different generations cycle through the store. Personally, he’s partial to riding the trails, at least these days. His mantra is, “Ride a bike and enjoy life. It goes by so fast. What is that saying? ‘Life is like riding a bike. As long as you keep pedaling you don’t fall down,’ ” he said. Anna Pratt is a Minneapolis freelance writer. She writes community-oriented pieces for the Star Tribune. Read more about small business stories, Small Business Success.